Earlier this year, nearly 500 Yemeni asylum seekers arrived at JeJu, a resort island in South Korea. At the end of 2018, only two people— journalists who put their lives at risk if they returned—received official refugee status. Even though a vast majority obtained temporary humanitarian visas, the refugees are expected to return to Yemen once circumstances in the war-ravaged country become no longer life-threatening. The government’s failure to aid asylum seekers reveals one paradox in Korea’s current cultural and political practices: while many facets of Korean culture, such as the entertainment industry, have made a strong global impact in the past several years, a strong sense of nationalism rooted in a desire to preserve the country’s cultural homogeneity is still ingrained among many Koreans—even the younger generation. The treatment of Yemeni refugees is one manifestation of this phenomenon. The influx of refugees from Yemen to Korea stems from years of warfare in an already poverty-stricken country. The civil war in Yemen, resulting in thousands of civilian deaths and displacement of millions of people from their homes, began when Houthi rebels from northern Yemen sought to overthrow the government led by President Abdu Rabbu Mansour Hadi. Subsequently, the government was forced into exile. In March 2015, the Houthi regime faced severe pushback as Saudi Arabia and other Arab nations joined in the hopes of reinstating the exiled government. Yemen has thus turned into a battleground between the Houthi regime, backed by Iran, and the Hadi government, backed by Saudi Arabia. Ever since then, airstrikes from Saudi Arabia’s military coalitions have killed innocent civilians, ruined infrastructure such as factories and hospitals, and made it more difficult for people to receive humanitarian aid. Indeed, according to the World Food Program, sixty percent of the 29.3 million people in Yemen are classified as food insecure. The extremely dire circumstances in Yemen have led many to flee from their home country. Around 500 of them ended up in JeJu, mostly because the island did not demand advance visas from Yemeni refugees at the time. Hardly an expected destination for displaced refugees, JeJu is renowned for its beaches, turquoise seas, and frequent sightings of newlyweds on their honeymoon. Therefore, when the Yemeni refugees stepped foot on the island, opposition was immediate and vociferous. Throughout the summer, protests erupted not only at JeJu, but also in cities on the mainland, such as Seoul. Online petitions calling for the removal of the refugees garnered hundreds of thousands of signatures. Thus began Korea’s first organized anti-asylum movement. Nevertheless, it is important to realize that opposition towards refugees in Korea did not simply begin with the arrival of Yemeni asylum seekers. More than 1,200 Syrians who currently hold humanitarian permits still lack adequate health care coverage and access to education. Lee Il, a human rights lawyer with the Seoul-based Refugee Rights Network, states that refugee status is granted only to one percent of applicants annually, an incredibly low rate for an already developed country. Even North Koreans, who have the highest rate of acceptance when applying for refugee status, often face a myriad of challenges integrating into South Korean society. 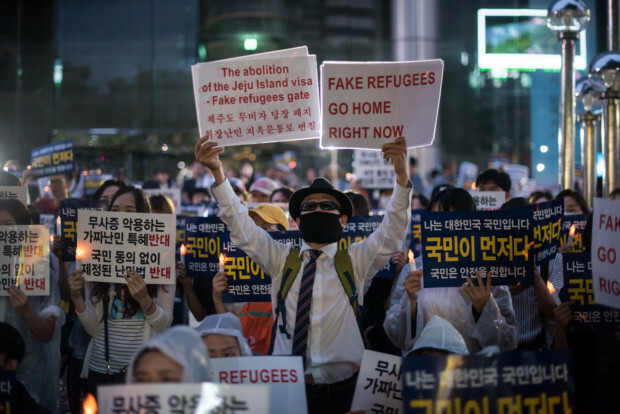 While the idea that xenophobia is a driving factor in the treatment of Yemeni refugees holds some truth, it should be explained within the economic, political, and cultural context in Korea. Monoculturalism, coupled with a history of foreign occupation, has instilled in many people a fear of outsiders. Consequently, foreigners in Korea still make up less than five percent of the entire population today. Furthermore, because economic circumstances have worsened over the past few years, the unemployment rate among the younger generation has risen to ten percent. This explains the surprisingly high rate of opposition to the incoming refugees among those in their twenties and thirties. While 49% to 56% of the general population are against admitting refugees, 70% of the people in their twenties object to the idea. On the other side, criticism abounds against the government’s procedure in screening applicants and its refusal to allow more refugees to remain in the country. Choi Young-ae, chairwoman of the National Human Rights Commission in South Korea, denounced the government for acting “in an indiscriminate manner to mitigate the public sentiments” against the Yemeni refugees. Needless to say, South Korea’s current practices—or lack thereof—of granting asylum to refugees does not bode well for its status as a developed country in a world that is arguably becoming more inclusive, albeit with reluctance from some.